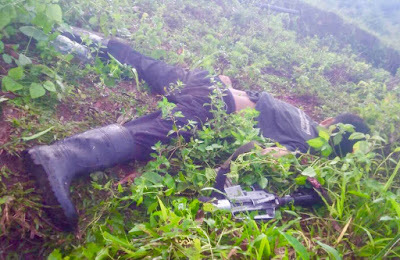 BAUNGON, Bukidnon – A Communist Party of the Philippines – New People’s Army terrorist (CNT) died in an encounter with 65th Infantry Battalion (65IB) at Brgy Lacolac, Baungon, Bukidnon, 5:20AM today, October 21, 2018. An information was received from a concerned citizen about the presence of CNTs in the vicinity of Brgy. Lacolac, which prompted the 65IB to launch its operations. The government troops were in Purok 1 of the above-mentioned barangay when they encountered the terrorists that lasted for 40 minutes. After which, the enemy scampered in different directions and the troops recovered one dead body from the CNT's side and his M16 rifle in the encounter site. The cadaver was already turned-over to PNP Baungon for proper disposition and identification. "It is very unfortunate that we lost another countryman today when an NPA terrorist died during an encounter with the troops of 65th Infantry Battalion. This could not have happened if the leaders of the said terrorist organization did not deceive and offer lies to our poor farmers and Lumads, which forced them to take up arms against the government," Brigadier General Eric Vinoya said. "The government offers the Enhanced Comprehensive Local Integration Program (E-CLIP) to those remaining CNTs who want to abandon the armed struggle," he added. Meanwhile, the Commander of 4th Infantry Division, Major General Ronald Villanueva AFP said they are willing to help NPA terrorists who wish to surrender. "We will assist them in processing for ECLIP. I am sure many of them wanted to go home to their families and love ones; many of them are tired of their lives in the armed movement; and many of them want to experience a life away from chaos, hunger, and fear of losing their lives in an encounter with our troops. I call on the remaining NPA terrorists not to waste your time in the failed armed revolution, these are the times that should be spent happily with your families and loved ones,” he expressed.